Chapter 4 Page 5 is up. Jassart and Mathilde stroll down Rue de la Citadelle past the Governor’s mansion and the other rich homes of Sherbourg. It’s the hoity toity part of Sherbourg. Come see where the rich and famous in Sherbourg live. 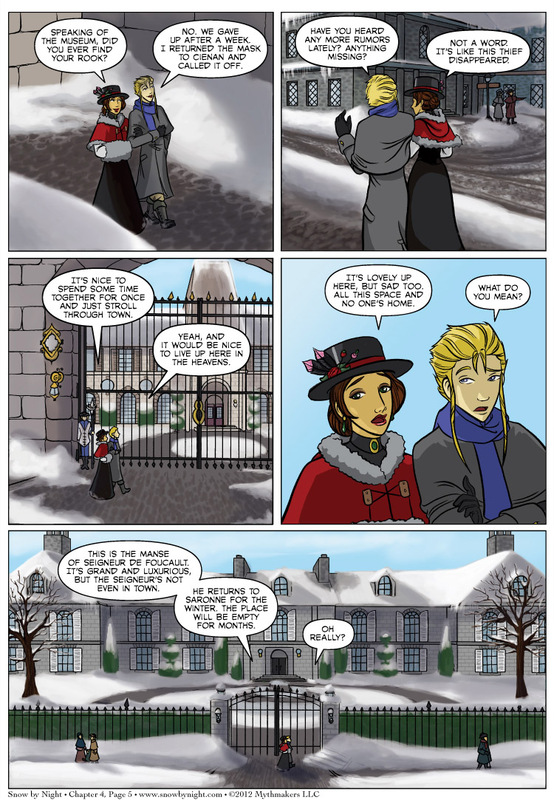 To see Mathilde’s stroll down memory lane, vote for Snow by Night on Top Web Comics. Hmm, might be time to peruse late summer passenger lists. Those are kept on file, right? I’m just sayin’, why hit one empty house when you can hit all of them instead?